OICD Intern Cristina Cusenza takes on one of the big themes in identity and cultural development: how can we diminish the power of dangerous and divisive singular identities by exposing and promoting the plural identity formulations that minority groups have developed? Cristina shares some of the insights from her anthropological work with members of the Turkish Alevis religious minority. 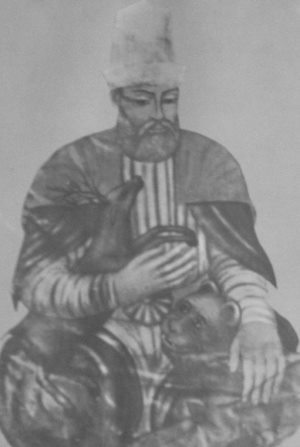 Hacı Bektaş Veli – the founder of a branch of Alevism – holding a deer and a lion in his hands, shows the importance of tolerance and equality at the core of Alevism. ‘Even a deer and a lion can coexist!’ (Informant). Social scientists, perhaps particularly anthropologists, understand that identities are not fixed nor “real” entities – they are in constant flux, multiple, imagined and contextual – brought into life through constant interaction with others. This ability to understand the illusory nature of identity presents an interesting challenge to the anthropologist: how do they reconcile the fact that the people that they study are often utterly convinced that the community/culture/religious group/political association that they belong to is bounded, fixed, and unquestionably “real”? These challenges are particularly stark when the researcher is studying those who have divisive agendas. Nationalist, right-wing, anti-immigration movements in Europe (Le Front National in France, for instance), or Islamic extremists advocating a global jihad for the sake of the ‘muslim ummah’ (the so called ‘ISIS’, or Daesh, in Arabic) are timely examples. Whilst it is important to treat such divisive constructions with care (not doing so might make them more powerful), surely any social scientist must also be compelled to expose them as the constructions that they are? One way to begin to do this is to look at the way in which historical/cultural narratives are being manipulated to be identity-mobilizing tools. Indeed, we can explore the precise ways in which different groups mobilise their identity in specific contexts and how cultural material is censored and edited to eventually de-historicise and un-fix accurate historical narratives. In searching for a way to break down the barrier between the “empowered” social scientist and “duped” community member, we might reflect on the fact that it is not necessary to engage in academic research to realise that in the course of our lives we all adopt different understandings of ourselves as individuals and as members of groups. In my own anthropological research with people from the Turkish Alevis religious minority, I have seen how multiple identities can be articulated in everyday cultural practice. Whilst they suffered waves of discrimination throughout the 70s and 80s because of their affiliation with Shiism, Alevis started enjoying much more popular and state support in the 90s. Still, Alevis today have to face the denial of their distinct religious identity through a series of subtle practices – for example, in the educational system, where the religious curriculum does not include the teaching of Alevism or traditions different from Sunnism. If the Turkish state can be seen to be in pursuit of presenting a uniformly secular (Sunni-dominated) notion of national identity, ‘alevism’ and its inherent cultural pluralism presents challenges to this singular construction. Alevism is a complex system of beliefs, which has been influenced by Shiism, Sufism, Christianity, Buddhism, and pre-islamic movements. There is little agreement amongst members themselves of what ‘Alevism’ involves, and multiple understandings of it are constantly debated. ‘Certainly our open-mindedness goes beyond the national border. We are curious, we believe that there is much to learn from our differences. We have this willingness to accept everyone everywhere in the world’. Members of the Alevis community illustrate how identity is deeply contextual, and how in order to orientate themselves in the world where narrow understandings of identity circulate, individuals may draw from different sources eventually being able to develop broad concepts of their own identity, or adopt different ones simultaneously. Understanding that such communities exist within even the most outwardly singular-oriented nations is incredibly important, not only for peacebuilding interventions, but in order to augment the ability to develop alternatives to the mainstream secular model which is generating several controversies in the world today. I encourage drawing from such open philosophies of life which celebrate plurality and difference, and thinking about practical ways in which such ideas can be applied. The promotion of such grass-roots pluralism (I call it localist cosmopolitanism) is a critical component of effective Identity and Cultural Development methodology, an integral part of the OICD’s mission to promote and protect multiple, open and inclusive notions of cultural belonging. The very obsession of contemporary secular states with regulating ‘religious life’ indeed seems to encourage the use of narrow conceptions of identity – particularly in the constant definition of minority-majority relations and rights. We must counter such movements towards identity and cultural singularities. Members of the Alevis community, and many others besides, are in possession of vital blueprints with which to help us to do so. Cristina recommends the following books for those interested in reading more on the “paradoxes at the heart of secularism”. Mayanthy Fernando’s book ‘The Republic Unsettled’ (2014) about the place of Muslim French living in France. Saba Mahmood’s ‘Religious Difference in a Secular Age. A minority report’ (2015), concerning the struggles the precarious situation of non-muslim minorities in the modern middle east (Egypt in particular).